Eggs are beautiful. That delicate white smooth texture and that round yellow accent in the middle whose intensity transforms and changes as it continues to cook. A bit of salt and pepper, and there you go. Your meal has been brought to life. I find eggs magical. They instantly bring some sun to any dish (pun intended). So basic. So elementary. Yet so surprisingly glorious. It’s funny that frying an egg is the first thing one tries out when learning how to cook, and it tends to be that simple element in recipes which seem to be the secret crowning glory. I suppose it’s that paradox of simplicity and sophistication which keeps this little dairy hard to keep away from. Here is one of the experimental breakfast (or lunch) hashes I have whipped in our kitchen where the egg literally completed meal. Sauté the garlic in a bit of olive oil, and add the potatoes. Sauté and leave to cook until potatoes are golden brown. Add the celery and green beans. 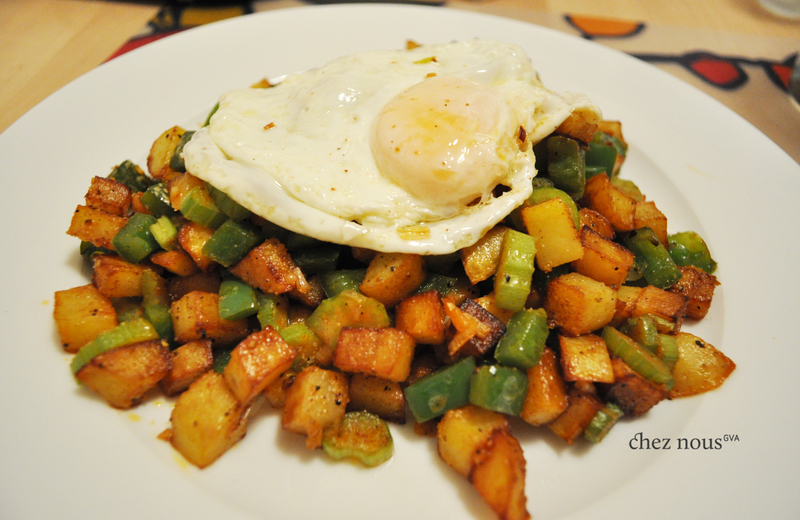 Crack some salt and pepper and sprinkle some paprika over the hash. Cook over medium heat for 6-8 minutes. more a cloudy side up than a sunny… well, i like the best, for sure. lets say, adapted to switzerland rather than philippines. It is a cloudy one indeed – just like swiss skies lately! I think its cooking tends to adapt to the immediate surroundings. haha!